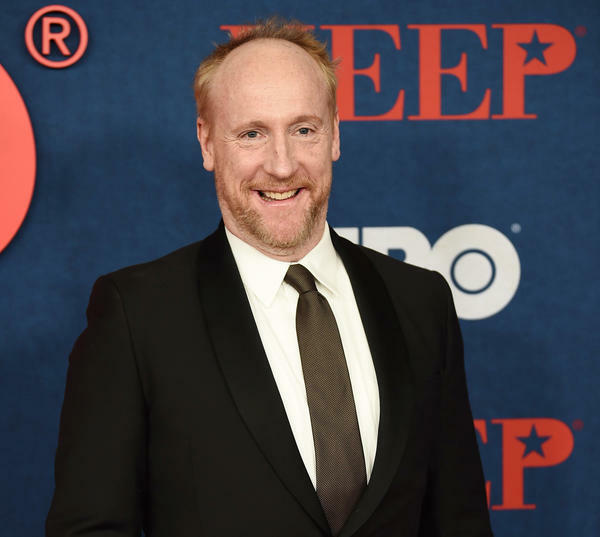 Matt Walsh attends the premiere of the seventh season of HBO's Veep on Tuesday in New York City. In season six of HBO's Veep, Selina Meyer, played by Julia Louis-Dreyfus, made some pretty dramatic decisions — she chooses to run for president to get a second shot at working in the Oval Office. In the process, she walks away from a chance at true love due to her belief that her relationship with Qatari ambassador Mohammed Al Jaffar, a Muslim man, could harm her campaign. Veep's seventh season starts on Sunday and picks up where the sixth one left off — Meyer has an exploratory committee in Iowa, along with 50 other candidates. She struggles with landing in the wrong town and neglected bills from her last campaign. Then, a ghost reappears: Meyer's fired press secretary Mike McClintock, played by Matt Walsh, shows up at a press conference in Iowa. Walsh's character is, however, no longer working on campaigns. His character is now a reporter working for BuzzFeed. This is the final season of Veep, giving Walsh a lot to reflect on. He spoke with NPR's Weekend Edition about the culmination of the popular show and what's next for him. I think he fancies himself a great writer. If he had his druthers, he would be a great author of great fiction. But, I think he likes journalism and it's weird for him to be on the other side of the ropes, because now all his friends on the campaign trail are completely cold to him and ignoring him and not very kind to him in a matter of minutes. Our show spans the crazy, scattered, frenetic evolution of media. When we started seven or eight years ago, Twitter was what Mike had to deal with. In the old days, when I talked to some real press secretaries — they said that they would read seven papers in the morning and they felt like they had a handle on the news cycle. ... I think getting to your initial question I think BuzzFeed typifies the frenetic, fast-paced, very bite-sized media world that we're all in. Obviously, it's flawed, like we push ideals through Congress, but ultimately there's compromise and there's just human flaws. So, I have sympathy. I would never want to be a politician, but I have true sympathy or empathy for people who have to work in that world for those people. They love it! Obviously the Republicans think we're making fun of the Democrats and the Democrats think we're making fun of the Republicans. So, that's the beauty of the show too — that it's pure fiction. We never say what side [Selina Meyer is] on. There's a lot of tears and goodbyes and cards — because it's a very meaningful experience. We were in the trenches in Baltimore for four years away from our families, so we bonded in a very deep way. And also, I think the process of the show — we would improvise a lot in rehearsals and the writers would sort of take notes, so I think we just got very close. I think I know what's right for the next two months, but two years, I don't know. I have a couple projects but we'll see. I think Julia called us two years ago, right before the Emmys, and said we're gonna stop at seven. I think we all assumed it would be eight years, so instantly I think the reptile actor brain was like, "Oh God I need another job." But in the process of seeing what the final season is and realizing very few shows get to go out on top and get to write their own ending, it's perfect. Knock on wood, I'll be fine. I can always bartend.